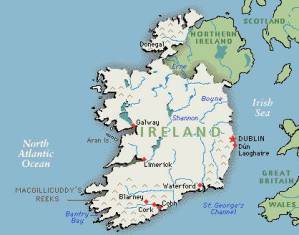 Éire is the Irish name of the island called Ireland. The name Éire is the nominative form in modern Irish of the name for the goddess called Ériu in Old Irish, a mythical figure who helped the Gaels conquer Ireland as described in the Book of Invasions. Éire is still used in the Irish language today to refer to the island of Ireland as well as the Republic of Ireland - as well as the goddess. The dative form Éirinn is anglicized as Érin which is occasionally used as a poetic name for Ireland in English, and has also become a common feminine name in English. The name was given in Article 4 of the 1937 Irish constitution to the Irish state, created under the 1921 Anglo-Irish Treaty, which was known between 1922 and 1937 as the Irish Free State. Article 4 stated that: "The name of the state is Éire, or, in the English language, Ireland." Article 8 states that Irish is the first official language. The name "Éire" features on all Irish coinage (and Irish euro coins), postage stamps, passports and other official state documents issued since 1937 — for instance the Official Seal of the President of Ireland. Before then, "Saorstát Éireann", the Irish translation of Irish Free State, was used except for postage stamps which regularly used "Éire" during the Irish Free State era in both definitive and special issues. Since 1949, the term Republic of Ireland has generally been used in preference to Éire, when speaking English. Technically, as the Republic of Ireland Act enacted in 1948 makes clear, the "Republic of Ireland" is actually a description rather than the name of the state, even if generally used as such. From January 2007, the Irish government nameplates at meetings of the European Union have borne both Éire and Ireland following the adoption of Irish as a working language of the European Union.